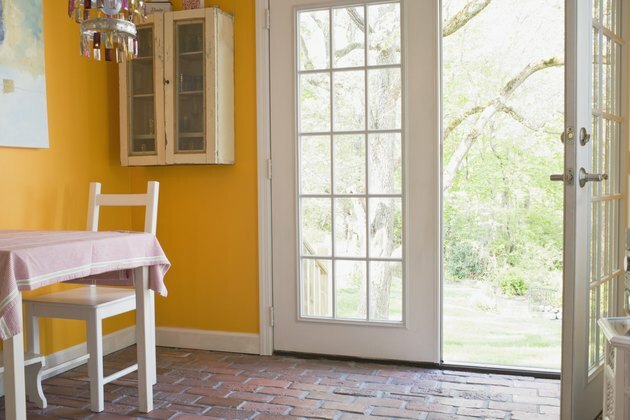 French doors are notoriously hard to dress with curtains. Panels hung over the door frame prevent the doors from opening properly. Attempting to open the doors while the curtains are closed damages the curtain fabric, rods and brackets. Rods hung from each door panel eliminate the problem, but there are only two types of rods that can be mounted to the doors without drilling holes in the doors: Magnetic rods self-adhere to metal french doors; tension rods suspend curtains from the window frame, provided the frame is thick enough. Curtains increase privacy when installed on exterior french doors. Measure the width of the space you want the curtain to span. It should cover the entire window and should not block the door handle, locks or hinges. Measure the distance between the top of the door and the bottom. Choose magnetic rods and french door curtains that fit the space. Position the magnetic rod bases at the top and bottom of the window. Check for level and adjust as necessary. Slide the top rod through the rod pocket at the top of the curtain and place the rod in the base. Insert the bottom rod into the bottom rod pocket and place the rod in the base. Measure the distance between the section of window where the rods are to be installed. Both ends of the rod must rest firmly against the protruding frame. Insert one rod through the rod pocket at the top of the curtain and one through the pocket at the bottom. Hold the top rod up to the window and unscrew the smaller side of the rod until it fits snugly between the window frame. Repeat, securing the bottom rod to the bottom of the window.